SABARIMALA: The Sabarimala pilgrimage in Kerala, during which over 100 pilgrims were killed in a stampede early this year, began early on Thursday morning as the sanctum sanctorum of the famed temple here was opened. 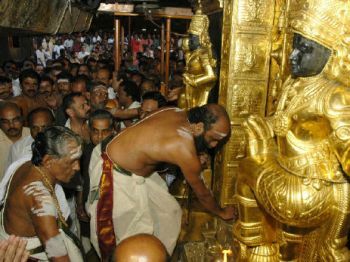 At 3 a.m. sharp on the first day of Malayalam month Vrishickam, temple melshanthi N. Balamurali opened the doors for the two-month-long pilgrimage season amid shouts of ‘Swamiye Sharanamayappa’. The Sabarimala temple, situated on a hilltop, has been crowded since Wednesday evening and pilgrims mostly from neighbouring Tamil Nadu and Andhra Pradesh stood in five queues – each extending to over a kilometre – waiting for the temple to open. With tragedy striking last season, this time the number of security personnel has been increased. A new footpath, a new bridge and a slew of other measures have been taken to decongest the route. Kerala director general of police Jacob Punnoose said that for a smoother and less crowded atmosphere, they have set up blocks en route to the Sabarimala temple to avoid any stampede in case of an excessive rush of devotees. State Devasom (the organisation that looks after the temple administration) Minister V.S. Sivakumar said this time there has been a change in the time at which the temple would open. It will open at 3 a.m. till 1 p.m. and then open again at 3 p.m. till 11.45 p.m. Heavy rush was witnessed at the Kottayam railway station since Wednesday evening when pilgrims arrived in large numbers from Tamil Nadu and Andhra Pradesh. With the administration still organising steps for a smooth pilgrimage, the scene was chaotic. The Kerala State Road Transport Corporation has special counters for the pilgrims and they operate numerous special pilgrim trips to the temple town, around 100 km from Kottayam. Situated on the mountain ranges of the Western Ghats at an altitude of 914 metres above sea level, Sabarimala temple is four km uphill from Pamba in Pathanamthitta district. It is one of the most famous Hindu pilgrim centres in India and has earned itself the tag of the ‘Mecca for Hindus’. The temple, which bars the entry of women who have attained puberty, is accessible only on foot from Pamba. Even though the Sabarimala temple is now open throughout the year, the peak pilgrimage season begins on the first day of the Malayalam month in November and closes on the first day of the Malayalam month in January. As many as 100 people were killed in the stampede in January this year when pilgrims were returning after watching the celestial Makara Jyothi light, the most important event of the pilgrimage, from a hillock some 30 km from the Sabarimala temple. The police tightened security on the Ayyappa temple premises and the Lower Thirumuttom area from Friday, P. Vijayan, police special officer at Sannidhanam, said. He said 15 commandos had been deployed on the temple premises and metal detectors would be installed at four points to monitor entry of pilgrims into the temple precincts. Special intelligence squads had been deployed at Sannidhanam, he added.